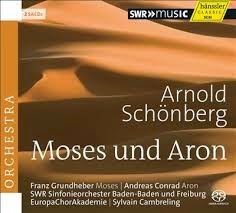 Schoenberg’s Moses und Aron is a work more discussed than listened to. That’s a shame, as it’s a really enjoyable opera. The writing for orchestra, and especially for the chorus, is continuously inventive and original, and the work’s dramatic conception is as bold as its music. It’s not without its flaws though, one of which is a feeling of stasis for long periods, especially in its first act, where philosophical issues are debated at length, but without anything else much happening. Arguably, that makes it a better candidate for audio-only presentation than most operas. Schoenberg seems to internalise much of the dramaturgy into his choral writing, something that can be fully appreciated on disc, provided the singing and the audio do justice to the music. This recording was made by Sylvian Cambreling and the SWR Baden-Baden und Freiburg Orchestra in 2012. That orchestra has since fallen on hard times, and is scheduled to be merged with another radio orchestra in 2016. A great shame, given that, as this release demonstrates, the orchestra is particularly strong in Modernist 20th-century repertoire, much of which is often in need of such specialist attention. From the recording dates and venues listed in the liner, the orchestra appears to have performed the opera in concert, touring it to four different cities – Berlin (the Philharmonie), Lucerne, Freiburg and Strasbourg. Each concert was recorded, and this commercial release was edited together from the results. Or perhaps all that work was done by SWR for broadcast, then licensed to Hänssler. Whichever way, the result is surprisingly consistent in terms of the sound quality, and the performance itself in impressively coherent given all the postproduction editing. Cambreling’s reading is dramatic but carefully paced. He skilfully negotiates the problems of co-ordinating the large orchestra, choir and soloists, and both he and the recording team ensure that balances are carefully maintained. The two lead singers (or vocalists, let’s say) are both proficient, neither particularly ostentatious, giving performances that seem to serve the work rather than using it as a vehicle for their own talents. Franz Gundheber, as Moses, weighs the Sprechstimme more in favour of speaking than singing: his performance is rhythmically sensitive to the music, but otherwise predominantly a spoken rendition. Andreas Conrad gives a muscular performance as Aron, suitably defiant and imposing. Both the choir and the orchestra meet the music’s technical demands, although there is a frustrating lack of detail, more a fault of the recording I suspect that the performances. That is a great shame, as this is the opera’s first outing on SACD. The recording is certainly involving, that partly a result of Cambreling’s narrative approach, leading the ear from one contrapuntal intrigue to the next. But a little more detail in the sound could have made this a much more satisfying, and revealing, experience. Despite the rarity of performances of this work (in the UK at least), it has fared well on record, and there are at least a dozen different versions currently available, many of which are DVDs of staged productions. It is rare for any to include anything from the incomplete final act, and this recording, as is conventional, only runs to the end of act II. Competition is strong, and I suspect one of the front runners is the Boulez recording with the Concertgebouw (DG 449174). The vitality and colour Boulez draws from the orchestra is on another level, and although the recording is almost 20 years old, the detail and clarity of the sound is never compromised by the audio quality. Cambreling’s version sounds more solemn, more ritualistic. It’s a different take on the work, and on its own terms it’s very impressive. The quality of the singing and playing is impressively high, and although the interpretive approach is less lively, it is certainly valid, and well-realised. The audio quality is acceptable, but not exceptional, which is a shame given what the technology has to offer. A conditional recommendation, then, with the proviso that other available versions are also worth exploring. We had this book in our school literature program. We all read it. Then we were discussing it in class. However, I didn't like it. It is too boring.